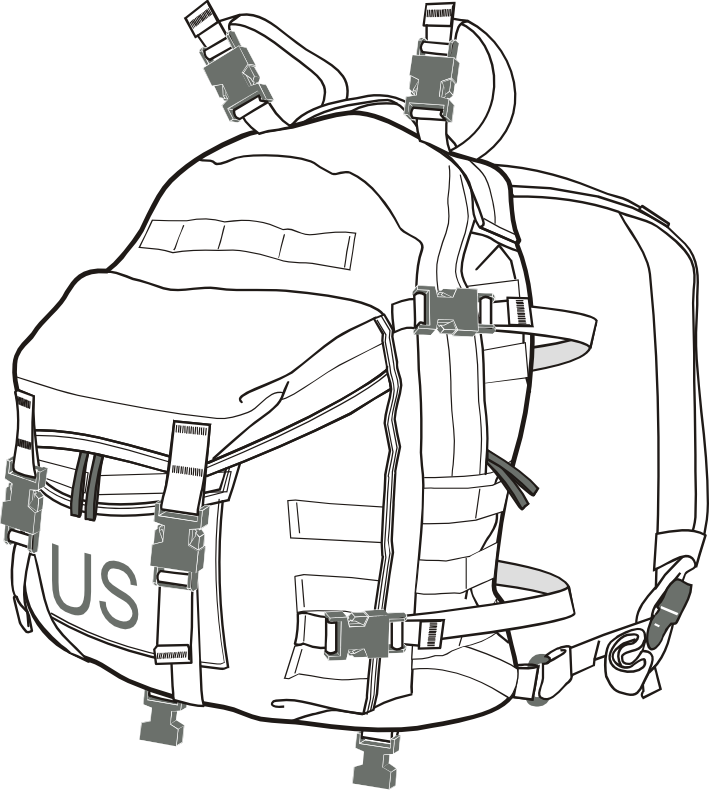 The MOLLE II Assault Pack has an approximate internal volume of 1525 cubic inches in the main compartment and 825 cubic inches in the large front pocket that is specifically sized to house a removable six magazine bandoleer or a standard protective mask and allow quick and easy access to it, and is capable of carrying at least a 60-pound load to include the current family of field radios including SINCGARS and ASIP. The radio can be carried in a radio pouch attached to the rear panel of the pack utilizing the 1 inch oval loops. The pack attaches to the pack frame on top of the main pack, in lieu of a patrol pack, or is donned and doffed over the FLC. The exterior sides and outermost surface of the pack contain PALS webbing to accomplish secure attachment/detachment of the modular pouches/pockets and other individual equipment items/carriers i.e., mattax, entrenching tool, two-quart canteen, etc. The pack is accessible through the top with a slide fastener closure and have a flap covering the opening and providing water resistance. There is a non-reflective slide in name holder for name identification on the exterior of the pack. The pack has drain holes. There are two 30" type 8 webbing used for airborne operations inside the pack. These white straps are used for direct attachment to the parachutist snaphook described in FM 3-21.220 pg 12-5, item #17, for integration with the T-10 Harness Assembly described on pg 2-2 item #14. There is also a sewn-in lowering line attachment loop.